Sails.js is a web framework that makes it easy to build custom, enterprise-grade Node.js apps. It is designed to resemble the MVC architecture from frameworks like Ruby on Rails, but with support for the more modern, data-oriented style of web app & API development. It's especially good for building realtime features like chat. Upgrading from an earlier version of Sails? If ES8 isn't for you, don't worry-- Node callbacks and promise chaining are still fully supported. But for most teams, the transition to await results in sizable gains in productivity, with fewer lines of code. Upgrade guides for all major releases since 2013 are available on the Sails website under Upgrading. For the most up-to-date introduction to Sails, get started here. Sails is built on Node.js, Express, and Socket.io. Sails actions are compatible with Connect middleware, so in most cases, you can paste code into Sails from an existing Express project and everything will work-- plus you'll be able to use WebSockets to talk to your API, and vice versa. The ORM, Waterline, has a well-defined adapter system for supporting all kinds of datastores. Officially supported databases include MySQL, PostgreSQL, MongoDB, Redis, and local disk / memory. Community adapters exist for CouchDB, neDB, TingoDB, SQLite, Oracle, MSSQL, DB2, ElasticSearch, Riak, neo4j, OrientDB, Amazon RDS, DynamoDB, Azure Tables, RethinkDB and Solr; for various 3rd-party REST APIs like Quickbooks, Yelp, and Twitter, including a configurable generic REST API adapter; plus some eclectic projects. For the latest core adapters and notable community adapters, see Available Adapters. Sails.js in Action by Mike McNeil and Irl Nathan (Manning Publications). 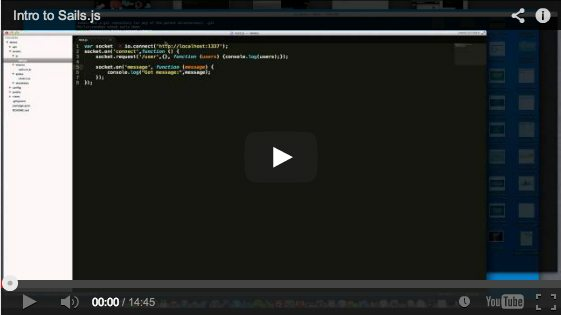 Pro Express.js: Part 3 by Azat Mardan (Apress). Please read the submission guidelines and code of conduct before opening a new issue. Click here to search/post issues in this repository. Please carefully read our contribution guide and check the build status for the relevant branch before submitting a pull request with code changes.